. . . very individual performances . . . you may be struck by the pace in the First Concerto . . . a deliberately measured performance that you might describe as soulful . . . Hélène Grimaud is an original . . . she often produces an unexpected tempo or sound. But it is always an authentic expression of her feeling for the music and determination to get under the surface. 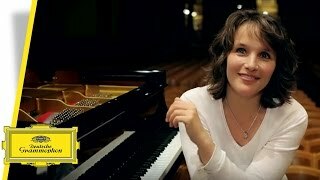 Hélène Grimaud is one of classical music's most talented [piano prodigies] . . . There are few classical pianists today who "feel the music" quite like Grimaud does. This is Grimaud's Romantic heartland, and her trademark flair and propulsion is etched over the recording . . . It's the D Minor (No. 1) that sparkles the most . . . The star of the recording is Hélène Grimaud, the celebrated French pianist, whose personal flair has evoked comparisons . . . with Martha Argerich and even Glenn Gould . . . If you like your Brahms on the energetic (vs. expansive) side of the scale, this live recording is the one for you. Grimaud is on fire and Nelsons is pretty hot himself. The two orchestras, the Symphonieorchester des Bayerischen Rundfunks in the First Concerto and the Vienna Philharmonic in the Second, could play these pieces in their sleep, but under Nelsons they're very much awake and fully caffeinated . . . this is a feather in Nelsons' cap and this fine recording can only be good news for him and the BSO.
. . . it would be hard to find a pairing that draws a greater distinction between the two [Piano Concertos] . . . With Nelsons and the Bavarian Radio Symphony Orchestra, Grimaud's second recording of the First sounds a tad less youthful, a tad more disciplined, but the balance between those two elements remains truly inspired. Nelsons and the Bavarians are on nearly every level a better match for Grimaud . . . in this case fully encapsulating a young composer out to make the piano and orchestra equal partners . . . The Vienna Philharmonic, by contrast, are a truly imposing force right from the opening . . . Where the Bavarians emphasise flexibility and spontaneity, the Vienna Philharmonic make the simplest musical utterances seem epic . . . by again forsaking power for emotional depth -- this time stressing an aura of contemplation -- her results end up being no less monumental.
. . . Andris Nelson, the man every orchestra desires . . . The E-flat's lyrical slow movement is affecting, her piano weaving tenderly with the Vienna Phil's solo cello and piping flute; intimate music-making of considerable beauty . . . [D minor]: an interpretation to admire . . . Grimaud and Nelsons have made their mark.
. . . unique interpretations . . . Hélène Grimaud turns her thrilling, deeply personal brand of music-making to Brahms's first and second Piano Concertos. Throughout her playing is sensitive, graceful, and commanding without ever feeling forced. Of particular interest here is the recording of the second concerto . . . with the Vienna Philharmonic who are on fire under the baton of the electrifying Andris Nelsons, one of today's most exciting young interpreters of the Romantic repertoire.
. . . undeniably one of the finest pianists . . . [this album documents] her incredible talent, and especially show that she is among the foremost interpreters of the piano music of Johannes Brahms. Grimaud's Brahms Second is big, epic and muscular: she brings out so much detail often buried or barely noticeable in other performances, and she captures that often elusive Brahmsian Romanticism, revealing a more human and more sensual side to the composer . . . Grimaud is spot on with a wide range of dynamics and deft interpretive sense. She delivers a subtle but powerful performance . . . The middle movements are equally convincing, and the finale is a delightful mixture of the playful and epic. Andris Nelsons leads the Vienna Philharmonic with a deft hand, drawing splendid playing from this fine orchestra. The sound reproduction is clear and powerful . . . [no. 1]: Once again the sound reproduction is extremely vivid and powerful, yielding all sorts of orchestral detail usually not heard on other recordings . . . Grimaud's darker approach is quite a valid one. The second movement is beautifully played . . . and the finale brims with energy and muscularity . . . Grimaud's forte chords are often very potent, almost overwhelming. The Vienna Philharmonic play splendidly throughout . . . overall her set can be considered in the company of the stronger efforts . . . The Second Concerto gets a very strong performance here, with perfect balance between the piano and the highly responsive Vienna Philharmonic. Grimaud's opening cadenza is broad and distinctive, and in the movement's later passages she plays with a wonderful forward thrust. Elsewhere, there is much colour and subtlety from all players, and the coda is grand. The scherzo could hardly be more exciting, with playing that often reminded me of Richter's in his great recording with Leinsdorf. Pianist, solo cellist, conductor and orchestra are of one mind in the wonderful slow movement, which exudes warmth and never gets bogged down. The finale is played with all the requisite lightness and character, with no hint of its difficulties and pitfalls. This performance is worthy of standing alongside the great ones by Richter/Leinsdorf, Serkin/Szell and Fleisher/Szell. The First Concerto, recorded live in Munich, contains much beautiful as well as passionate pianism.
. . . [an] utterly remarkable, inspired and inspiring recording . . . Nelson's slower pace is all about unfolding the Brahms universe with its profound richness of detail and astonishing warmth of tone. There are so many recordings of Brahms First Piano Concerto, but few could be classified as Desert Island Discs and in fact many are downright disappointing. Well this performance of it recorded live in Munich changes all of that, and if by the end your legs are still able to support the weight of your body, assume that Brahms just isn't really your thing. From that first opening orchestral chord, surely the most arresting ever captured on disc, Nelsons announces the epic scope of the enterprise ahead. Just three seconds in and your breath's been taken away, and from there, he and remarkable Frenchwoman Grimaud are like two Alices in the Brahmsian Wonderland, each glorious new entry, whether in the piano itself, on the horn, or especially in the lower strings, unfolding at a tempo beyond human agency, like the clear dawn emerging after a storm, dazzling the senses in the process. Grimaud's drama-charged, percussive style, eschews sentimentality but remains passionate nonetheless, filled with an emotion generated from within the music itself, the performers simply a part of a much larger whole. This is Brahms in 3D, everything standing up and being counted, almost as if it has some sort of moral presence all its own, gorgeously captured by the DG engineers in this textbook example of live recording. And then, after two movements of vastly intelligent, intense colour and drama, the finale of the First enters, now transformed into breakneck pace, but never losing its shape or focus as Grimaud, noted for her technical prowess, simply rips the thing apart . . . My God, what a disc.
. . . a superb pianist at the height of their powers is teamed to a conductor with whom they seem to have instinctive rapport . . . very exciting [playing] . . . monumental [approach] . . . Nelsons secures some delightfully pointed orchestral playing in No. 1's finale, and really creates the restorative calm of No. 2's slow movement . . .
. . . this twofer of the composer's two piano concertos finds Hélène Grimaud, a well-known, seasoned artist in her prime, at the keyboard, and . . . Andris Nelsons on the podium . . . Grimaud's technical mastery of these two big concertos is not, for a single moment, ever in doubt, and the tone she draws from her instrument is magisterial. Das Spiel der Grimaud ist spannend in seinem dunklen Sinnieren, im zarten Fabulieren und leidenschaftlichem Aufbegehren. Klangmagier Andris Nelsons, dem diese Epoche ohnehin besonders liegt, zieht überzeugend mit.
. . . eine ideale Interpretation von Brahms -- ohne Wenn und Aber!
. . . eine emotionale Achterbahnfahrt . . . zwischen feuriger Leidenschaft und rückblickender Nostalgie . . . Wer Klaviermusik liebt und die Musik der Romantik nicht als pure Gefühlsduselei abtut, der kann von diesen zwei Konzerten nicht genug bekommen -- und wird sich freuen, dass Grimaud mit ihrem Album den bisherigen Aufnahmen eine weitere hörenswerte hinzufügt. Wer Hélène Grimaud und das Symphonieorchester des Bayerischen Rundfunks unter Andris Nelsons im vergangenen Jahr mit dem d-Moll-Konzert live im Münchner Herkulessaal erlebt hat, dürfte sich über die Wiederbegegnung via CD freuen, denn es war fraglos eine pianistische und orchestrale Sternstunde . . . Nelsons ist ein Vollblutmusiker alter Schule mit vergleichsweise getragenen Tempi, der eine gesunde Balance herstellt zwischen dem exorbitanten Solopart . . . und dem symphonischen Anspruch der Werke . . . ihr markant energetisches Spiel, ihr perlend klarer Anschlag, ihre bezwingende Phrasierung und ihre lyrische Intensität imponieren jederzeit. Den beiden Klavierkonzerten von Brahms tut es mal ganz gut, wenn sie nicht als Kraftproben zwischen Solist und Kollektiv aufgezäumt, sondern als lebhafte Dialoge ausgetragen werden. Und dieser durchhörbare Ansatz ist hier auch klangtechnisch vorbildlich realisiert.
. . . eine Künstlerin mit vielen Facetten, die ihre Hingabe an die Musik stets betont . . .
. . . ebenso kraftvolle wie feinfühlig ertastete Einspielungen . . . Beide Konzerte sind in ihrer Lesart Monumente romantischer Konzertarchitektur, gewichtig und aussagestark, persönlich gefärbt und erkämpft von Komponist und Interpretin. Das Spiel der Grimaud ist spannend in seinem dunklen Sinnieren, im zarten Fabulieren und leidenschaftlichem Aufbegehren. Klangmagier Andris Nelsons, dem diese Epoche ohnehin besonders liegt, zieht überzeugend mit. Mit dem Symphonieorchester des BR und den Wiener Philharmonikern inszeniert er den Wandel von existenzieller Orchesterwucht und zerbrechlicher Besinnung. Intensiv sind diese zwei mal 50 Minuten, weil Grimaud und Nelsons in den oft gehörten Konzerten über nichts hinweg huschen und zahlreiche Facetten ausmusizieren, die sonst unter Virtuosenattitüden gerne untergehen.
. . . eine sehr konzentrierte Künstlerin, die tief in die Musik abtaucht. Sie macht buchstäblich jeden Ton hörbar, legt die verschiedenen Ebenen der Musik frei. In diesem Fall auch die Ebenen zwischen jungem und altem Brahms. Der sinfonische Feuerkopf trifft auf den dünnhäutigen grüblerischen Brahms im 2. Konzert. Andris Nelsons ist als Dirigent eine ideale Wahl, denn er bringt die Offenheit mit, die es Grimaud erlaubt, ihre musikalischen Vorstellungen gemeinsam mit ihm zu verwirklichen. Dass zwei unterschiedliche Orchester auf der CD zu hören sind, stört überhaupt nicht . . . Im Gegenteil, da die Konzerte von so unterschiedlichem Charakter sind, ist es sogar interessant, zwei verschiedene Orchesterklänge zu hören. Es sind diese besonders innigen Passagen im zweiten Klavierkonzert von Johannes Brahms, die einen sofort für die Produktion einnehmen: der Anfang mit der mild-romantischen, wie mondbeglänzten Hornpassage und den glitzernd tropfenden Klaviertönen dazu. Oder, mehr noch, die wehmütigen Streicherklänge des Andante-Satzes, deren Farben die Pianistin aufzugreifen scheint . . . wer Liszts h-Moll- Sonate so forsch wie sie auf die Bühne wuchtet, kriegt . . . auch den alten Brahms in den Griff. Das führt zu einem schönen Scherzo und Finalsatz. Richtig begeisternd indes ist ihr Zusammenspiel mit den Wiener Philharmonikern und Dirigent Andris Nelsons im langsamen Satz. Schwelgen erlaubt. Grimauds Zugriff auf das frühe erste Klavierkonzert mit dem ebenfalls fabelhaften Münchner Orchester wirkt, dem Charakter des Stückes entsprechend, eine Spur forscher . . . die quirlige Finalstimmung macht richtig Spaß. Immer wieder gelingen der französischen Pianistin berückende Momente, vor allem das Andante im zweiten Konzert mit dem berühmten Cellosolo hat einen hohen Gänsehautfaktor . . . [Andris Nelsons] weiß Brahms' Notentext zwischen leiser Melancholie und energischem Impetus mit beiden Orchestern überzeugend auszudeuten. Es ist vor allem die erstaunliche Transparenz von Grimauds Klavierklang, die beide Aufnahmen faszinierend macht. Die Musik wirkt mitreißend und sehr intensiv, aber auch wunderbar luzide.
. . . [Brahms 2]: une oeuvre difficile dont elle triomphe . . . Pour elle, le plus beau compliment, ce serait que grâce à cet enregistrement du Deuxième Concerto, un auditeur lui dise que son amour pour ­Brahms est devenu le sien, et que ses combats pour la planète, pour la beauté et pour la musique sont aussi devenus les siens. Dès la cadence du premier mouvement . . . sa profondeur de jeu et son sens instinctif du rubato font mouche. Le flot d'accords et d'arpèges ne semble pas avancer au hasard, mais tend vers une seule et même direction, conduisant au hiératique scherzo qui fit le succès de l'oeuvre. L'andante, de nature plus méditative, devient le théâtre d'un dialogue heureux avec le violoncelle, qui n'est pas sans rappeler le délicieux équilibre de la Première sonate pour violoncelle, enregistrée par Grimaud sur son dernier album (Duo) avec Sol Gabetta. L'opus 83 est naturellement le sommet du disque. Mais la pianiste aixoise ne pouvait envisager de le séparer du Premier concerto. Ce dernier, enregistré avec l'orchestre de la radio bavaroise . . . complète idéalement ce disque qui s'annonce superlatif.
. . . Hélène Grimaud révèle, comme nul autre, l'intensité du concerto numéro 2 pour piano de Brahms . . . Un oeuvre a parfois la chance de croiser un interprète digne d'elle. Brahms a Hélène Grimaud, capable d'une infinie sensibilité. Une artiste d'exception qui, loin de notre monde empli de pesanteurs, emprunte les chemins de l'éternité. Son interprétation du concerto numéro 2 de Brahms. . . est exceptionnelle, d'une rare intelligence, d'une vélocité foudroyante, d'une musicalité lumineuse. En quelques mesures, son chemin devient le nôtre. Hélène Grimaud est un passeur. Elle nous aide à traverser les sables mouvants des mesquineries quotidiennes. Son nouvel album, comme les précédents, nous rappelle à l'essentiel. La beauté de son langage et la maitrise de son jeu nous offrent des instants volés à l'irrémédiable tension métaphysique de l'existence. Un parfum d'éternité, au coeur des émotions intimes, indispensable à notre discothèque.